Episode 283. Aired Wednesday, January 16, 2019. What do you do when life’s water balloon explodes inside your house? This week we had to pivot and we will be doing our episode with Adam Grason soon I promise. But we had to reschedule. I look at it like this, Adam and I both were looking forward to this episode. I had a ton of questions and he has some amazing answers. But sometimes God has other things scheduled. Sometimes these life events are big, and sometimes they are small. I had two friends who lost everything in Katrina (Hurricane on Gulf Coast back in 2005). When a wrench is thrown in your life or your day, either way… you have to pivot. I do think it is important to see it from another perspective, especially when it deals with another person because of a conflict or misunderstanding. Sometimes realizing how someone has it worse or that you are able to count your blessings, is a perspective often lost on people. It was a really hard time for my dad. They had bought some property and built a house back in 2000. There are about 10 acres to mow. I would go up there and mow every month so it would be done and that was one thing they wouldn’t have to worry about. I was mowing on my dad’s tractor. One week at the end of the summer, my dad was home and feeling really like he did not have a purpose. He walked me to the pole barn and got me started on the riding lawnmower for the front yard (they have grass here, you know pretty grass). He always picked up that grass and dumped it, they have a small John Deere riding lawn mower. That was to be my job for the afternoon. Well I ran out of gas. At this point my dad could walk but it was slow. He was not comfortable walking on anything but pavement. I did not know I was out of gas, I thought something was wrong with the mower. Well I went back to the pole barn got the gas and filled it up. Then I told Daddy to get on the mower and drive it up the hill since he wasn’t so great at walking off-road. He did and I never got to finish that yard. He did. His perspective had shifted, he was so grateful to be productive and doing something useful. That was all he needed. I think that is a huge part of what is important to me, is that important to you? Leave me a comment below and let me know. Because you mean a lot to me and spending time with you is important, I wanted to do another meet-up. We did this back in April I believe. I did not record it, but I think I might this time. I thought that there is no better time for community than when we start a new year. I really enjoy when a few of us (max 100) pop online and talk about a topic. Ever since last week’s episode, I have been thinking about how we pivot as we are finding new things we want to learn. How do you learn? What tools and resources have you used to get you further? What happens when you get into a subject and decide you don’t like it? 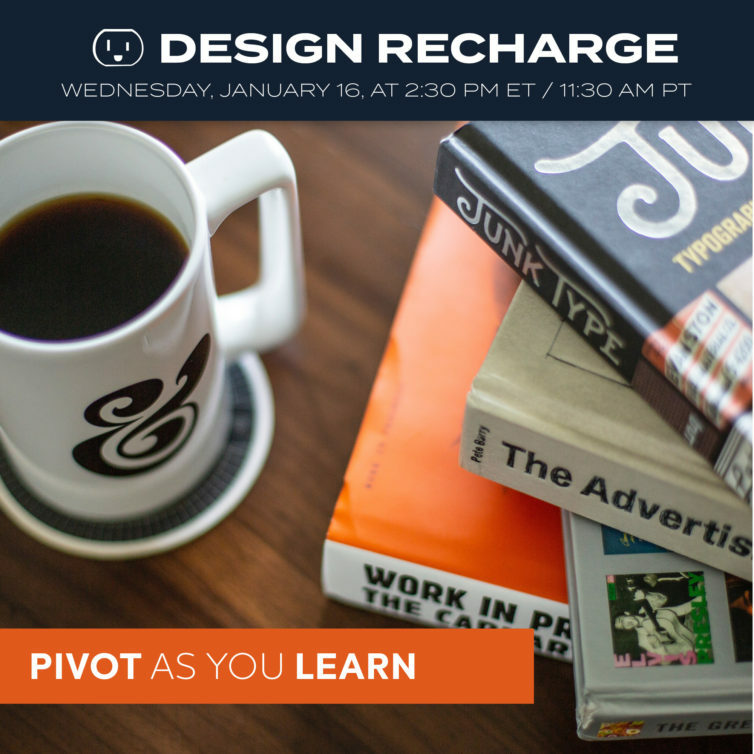 What do you do when you need to pivot to move ahead? Recharging You helps freelancing creatives find and utilize their strengths and guides them in reaching your business and creative goals. Our goal is to inspire, motivate, and guide creatives in order to realize and apply each individual’s expertise through training, coaching, and creative activities. Recharging You is the home for The Design Recharge Show which is an interactive, web show and podcast recorded live with an audience where interviews of designers, illustrators, industry leaders, and business professionals happen weekly.